I really feel like I need to do a bump update soon because this pregnancy has gone from “I feel great!” to “I’m getting so uncomfortable!” I know this was to be expected near the end when the baby is getting bigger and I’m thankful we’ve only got about 7 weeks to go. Tomorrow is her “Sprinkle” and I’m excited to celebrate her with my family and girlfriends. 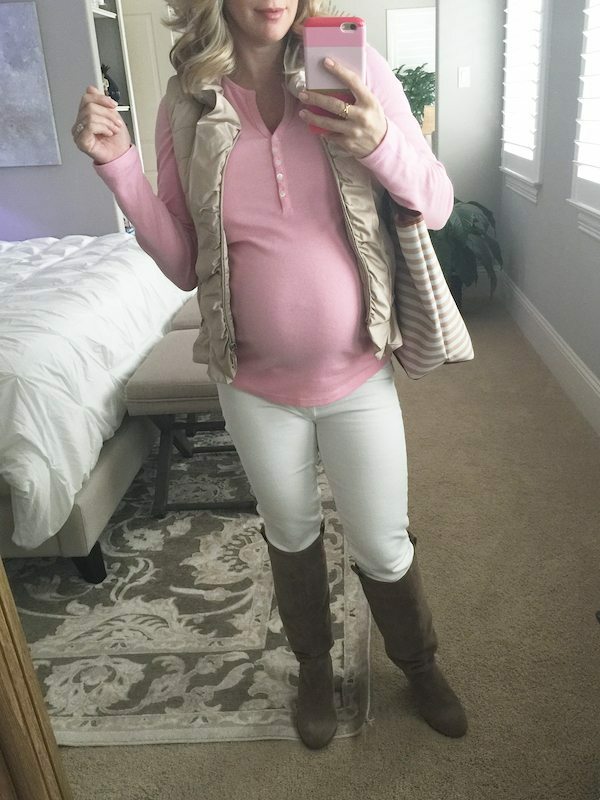 I’ve literally only bought a handful of things this pregnancy (so different from our first! ), so it will be very sweet to receive some baby girl outfits and diapers! Let’s just start with this in-your-face belly shot. If we weren’t before, we’re out proud now! And I’m finally wearing white maternity jeans! I’ve been wanting some forever so I could indulge in one of my favorite trends of the season – winter white. 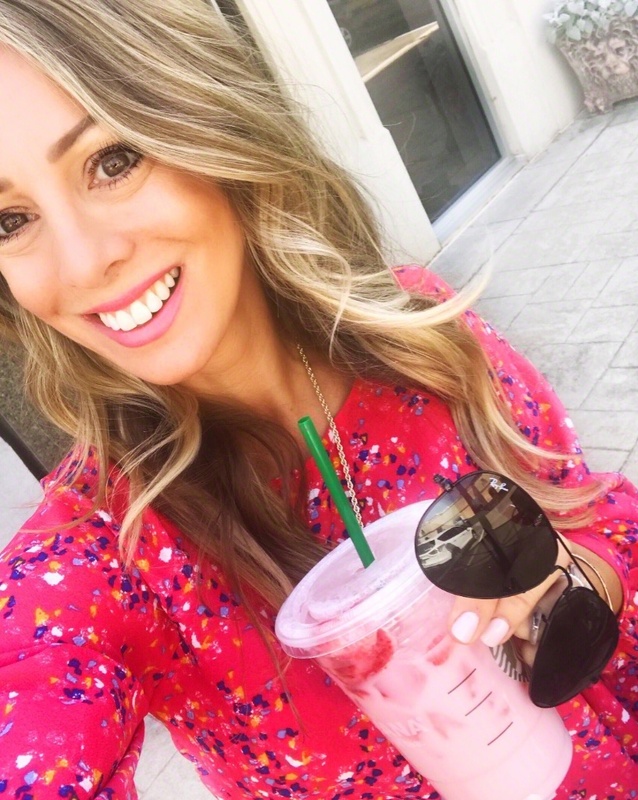 I mixed and match some tops and boots from my closet to come up with a few looks you can replicate, probably with things you already have in your closet, but if not, I’ve included maternity & non-maternity options. If you’ve been around here long, you might know my very favorite white jeans are the AG Prima Mid Rise Cigarette Jeans. I’ve raved about them before, but they are awesome because of the thicker weight material that doesn’t look or fit like leggings, so your legs won’t look like sausages! 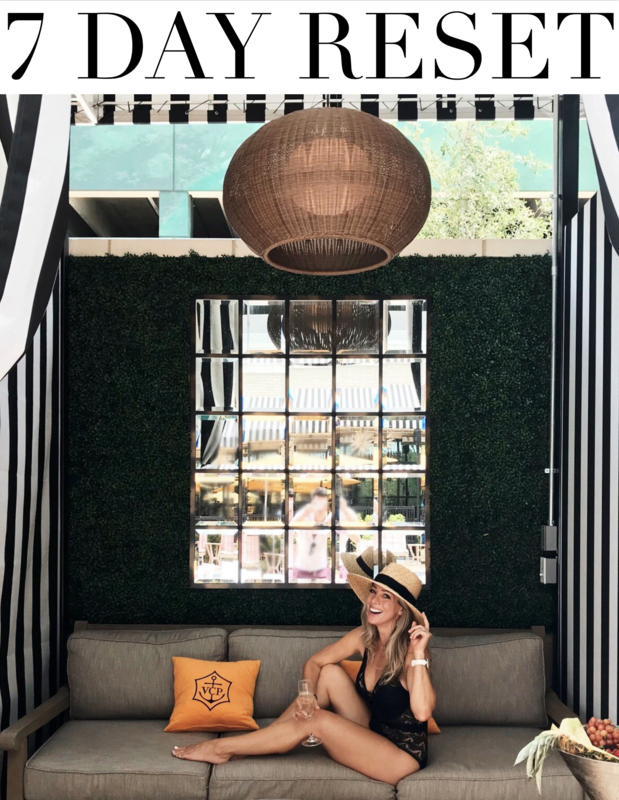 The Madewell skinny white jeans are a good option too, and for under $100, I’d recommend the Vince Camuto or Treasure and Bond. I was hesitant to break out the puffer vests since they are pretty small on me now, but they still add that extra layer of warmth and more interest to the outfit. This vest is old from White House/Black Market and I adore the ruffles on it- you don’t see many puffer vests with that detail. 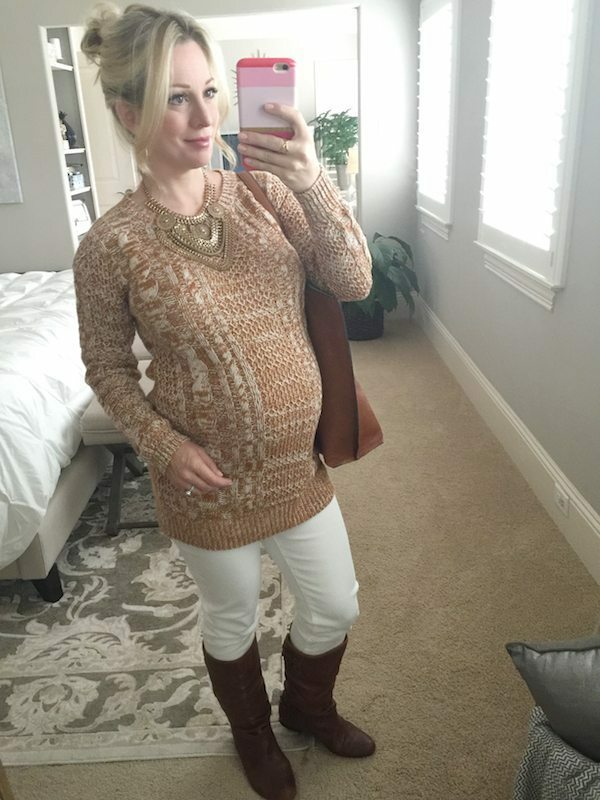 The henley top (maternity & non-maternity) is really cute and comfy. Love the neckline and they are both on sale. 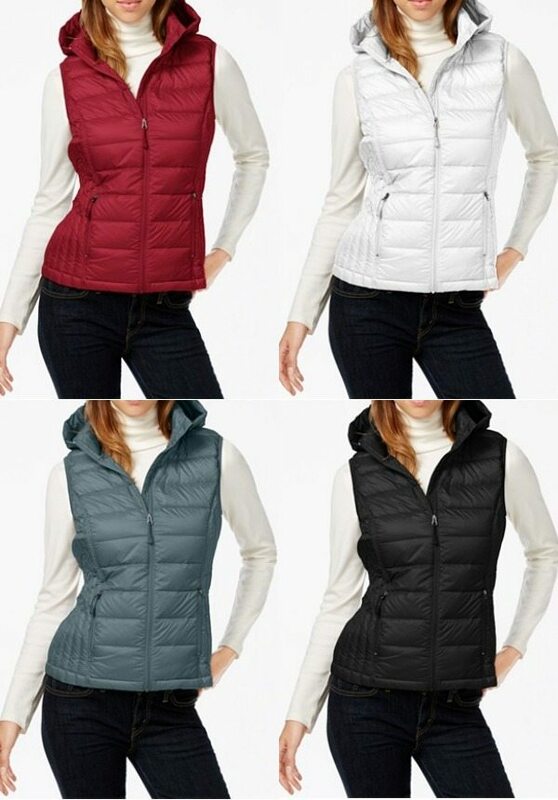 Tan and white puffer vests are challenging to find, but this style is cute (looks like it’s more fitted at the waist so it’s slimming), and comes in lots of colors – bonus that it’s on sale for under $30, normally $60! White jeans, boots and a cable knit sweater look great together. I’d put together this combo awhile back, but I’m only now actually getting to wear it. The cable knit sweater is 40% off, under $30 now and comes in 4 colors. This knit pullover sweater (40% off) would also be cute with white jeans and brown boots. Or the pink one I left behind. I regretted it, but now that it’s on sale 40% off, I might have to order it! It was really cozy and came in three other colors. You can’t go wrong with jeans and a tee and I tried pairing together white jeans, a grey maternity tee and brown boots here because when I had on black boots at first, they looked too severe. The brown boots add more warmth to the outfit and to tie it together I grabbed my tan reversible tote and leopard scarf (similar). Great weekend outfit for running around and still feeling put together. 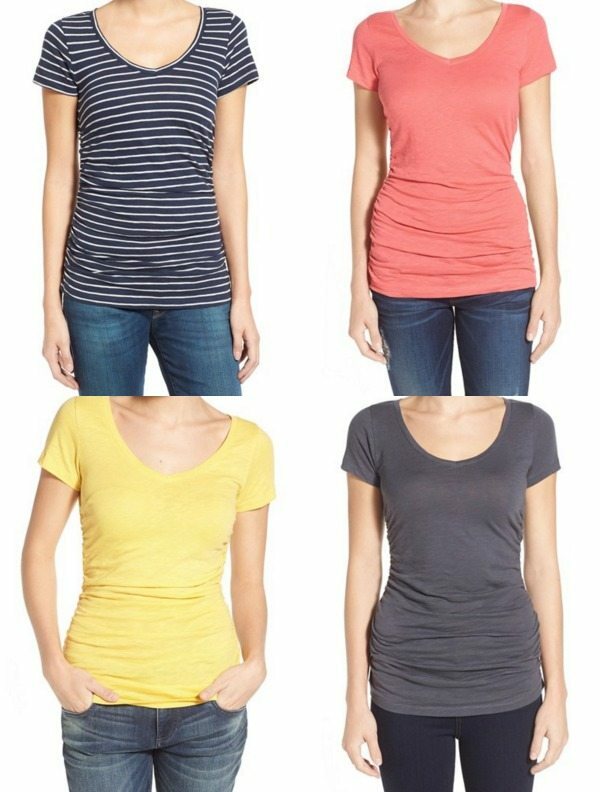 This non-maternity tee has a nice v-neck and rushing on the sides for a flattering look. Size up if you don’t want it as form fitting. It comes in regular and petite too. 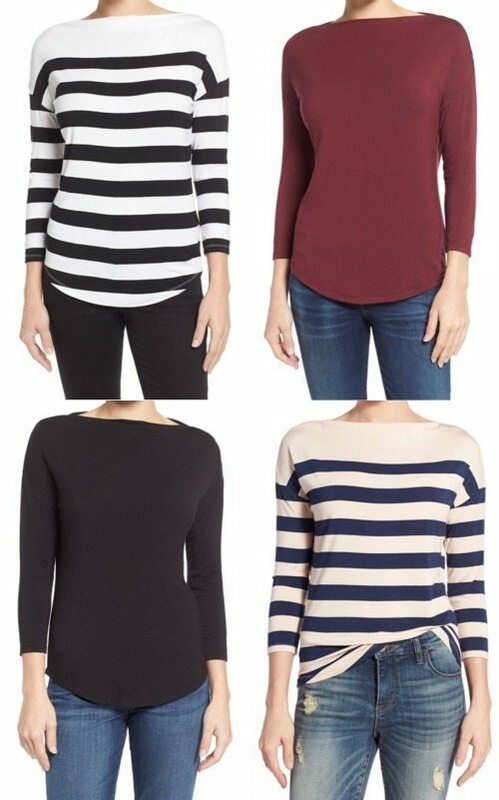 I love how a boatneck tee shows just a glimpse of neck and they look especially good in a 3/4 sleeve. These are new at Nordstrom for $38. 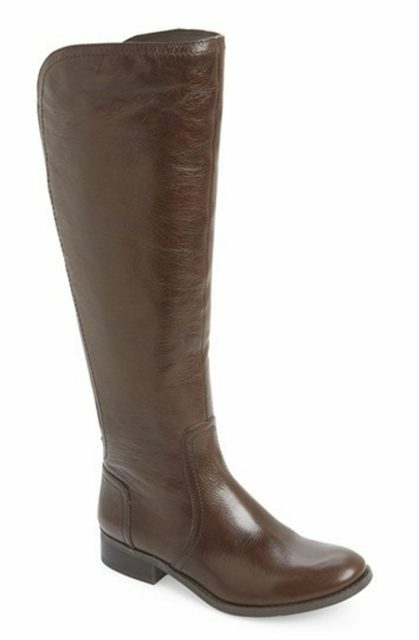 I found 3 pair of brown knee high boots on sale that are a good alternative to my old ones. It’s only just now cold enough in Houston to be able to wear boots daily and we’re loving it! I put together two winter white outfit collages for you and I want to wear both of them! White and all those soft caramel colors are so gorgeous this time of year. Instant sophistication while still being comfy! I’m dying over that bag (only $56! ), but the site says it’s backordered until March. 🙁 I’m still interested though because I’ve often received things sooner than the site says. This similar taupe bag and this cognac one are both in stock if you can’t wait though! In Outfit #2, I added in more blush pink and a pop of pizazz with that budget-friendly leopard clutch. The crystal and fringe necklace is 50% off now and how luxe does that scarf look for only $24?! 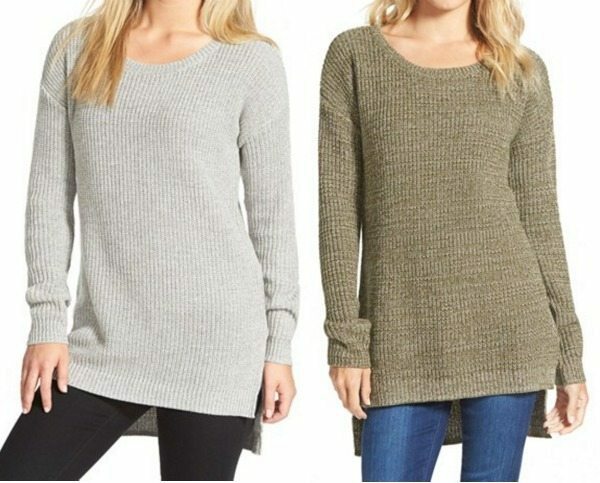 The v-neck sweater has a side-zip detail and also comes in grey and taupe. It’s $42! 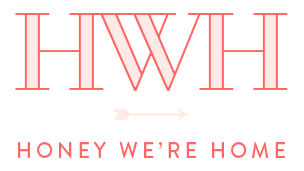 Want more winter outfit ideas (on sale), go here & here! And if you’re pregnant like me, How to Build a Mix & Match Maternity Wardrobe might be helpful. 🙂 Have a great weekend friends! 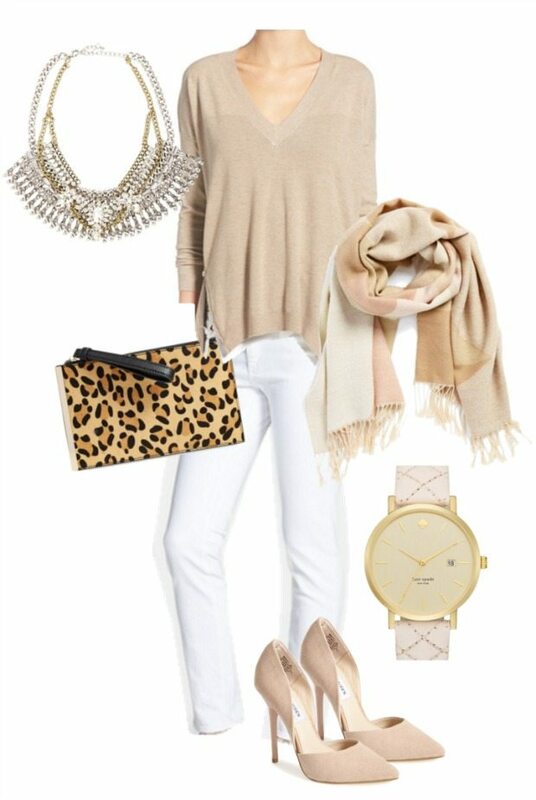 Great outfits, I love the idea of winter white. 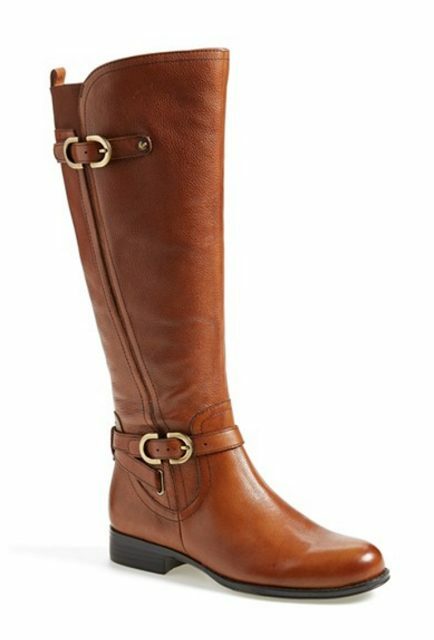 I like the boot picks you chose, I have been boot shopping for weeks now, I have skinny calves and everything I like looks really sloppy on me. Most people have the opposite problem! I'd be curious to hear which ones you liked best for skinny calves when you find some. 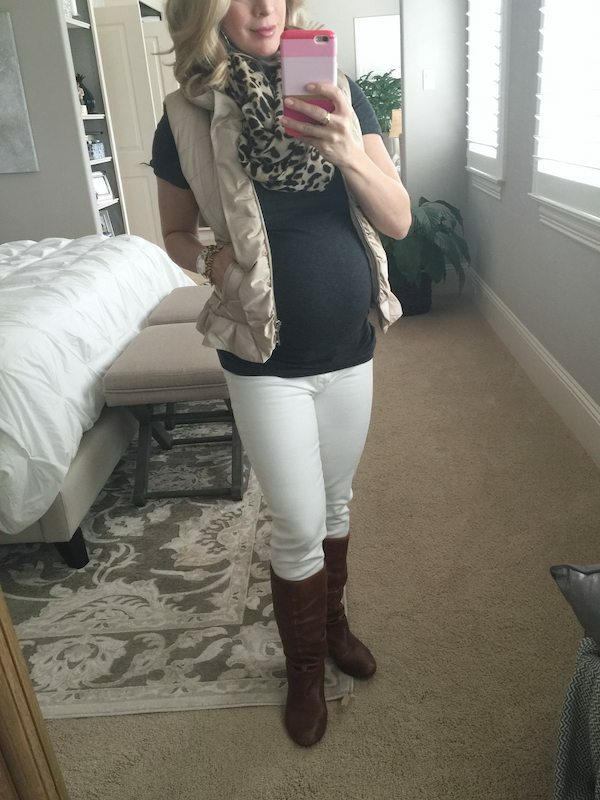 I have been dying to wear my white pants but I haven't purchased any in maternity! Your making me want to take the plunge and buy a pair with all these cute outfits. 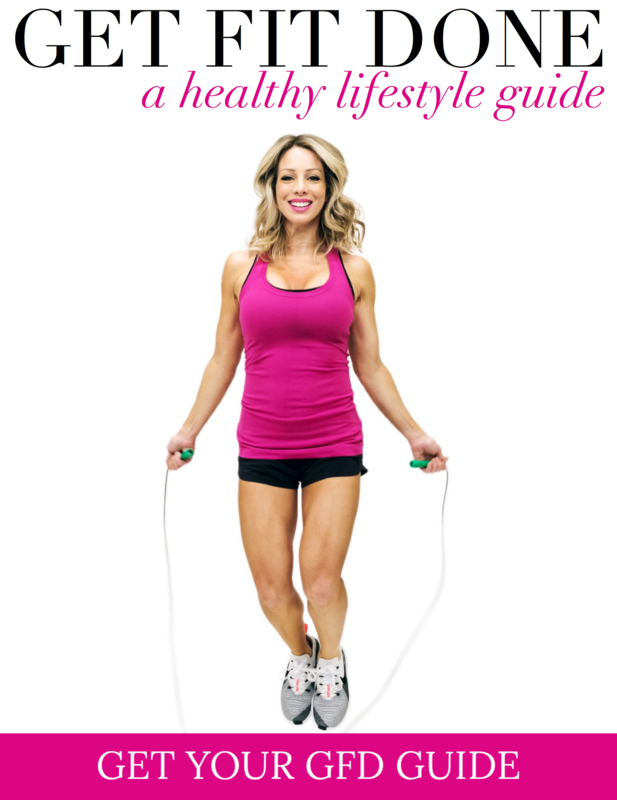 I was so happy when I moved into maternity jeans – they were just so much more comfortable. I totally get that. These were definitely a splurge- I'll probably try to sell them later to recoup some of the cost. I barely spent anything my first pregnancy, wore mostly borrowed, but decided to indulge in this pregnancy, which will likely be my last. At age 40 I'm feeling over-blessed to even be having a healthy pregnancy. I have the same issue, Andrea. If you haven't already, I would recommend taking a look at the Clark's boot selection. 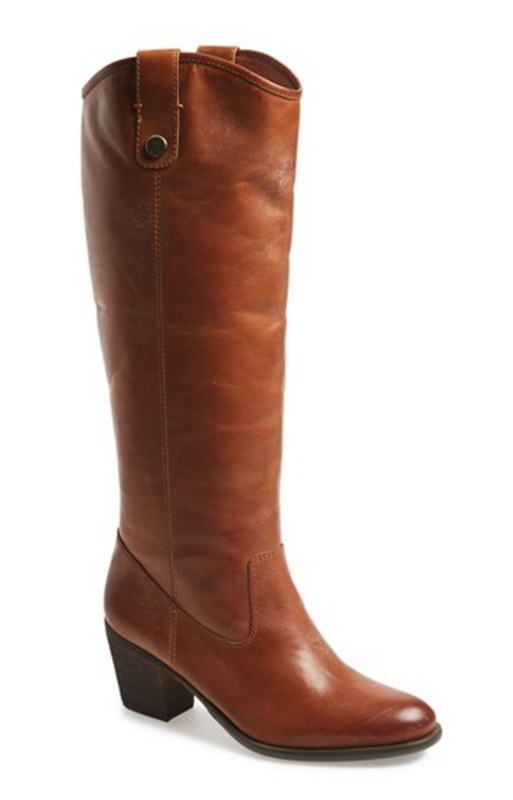 They have some really great options and I was able to find boots that actually fit my leg shape and worked for me. Best of luck and hope this helps! Thanks so much for this tip! I always see wide-calf options, but the skinny-calf boots seem harder to find. No one wants to be drowning in their boots!